"Up in the sky - look!" "Faster than a speeding bullet! More powerful than a locomotive! Able to leap tall buildings at a single bound, this amazing stranger from the planet Krypton, the Man of Steel - SUPERMAN! "Possessing remarkable physical strength, Superman fights a never-ending battle for Truth and Justice, disguised as a mild mannered newspaper reporter, Clark Kent." "The Superman cartoons are great! They're full animation, and the earlier ones adhere very closely to what we were doing in the comics." 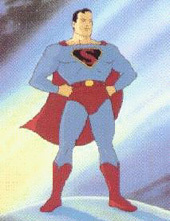 In addition to his landmark radio work, Bud Colyer was the first person to portray Superman in motion pictures, once again lending his voice when the Man of Steel made his big-screen debut in animated cartoons. These innovative science fiction spectaculars remain among the most technically polished examples of the "short film" art form. 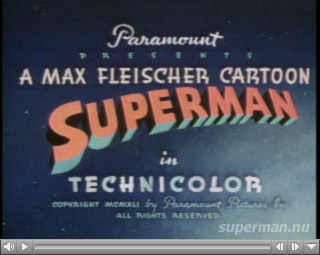 Launched in September 1941 with the release of the initial entry, Superman, the cartoons were produced by Max Fleischer. The Fleischer studio was initially based in New York and was famous for its rambunctios, rough-and-ready presentation of characters like Betty Boop and Popeye. The studio had just relocated to an enlarged modern facility in Florida. Joe Shuster drew the model sheets for Lois Lane, Clark Kent, and Superman. The first cartoon was received to critical acclaim and was nominated for an Academy Award. The Superman shorts look like feature films, complete with tracking shots and a stunning variety of camera angles, each of which necessitates a new background. Artists duplicate real illumination, molding the characters with light and dark, and providing them with dramatic shadows. The films move at an accelerating pace, with cuts coming faster and faster toward the climaxes, propelled by Sammy Timberg's dynamic musical scores. Special effects involving fires, rays, and explosions set the screen ablaze. The second cartoon, The Mechanical Monsters, was released near the end of 1941. 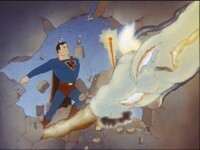 It features Superman battling an army of gigantic, flame-spewing, flying robots in a series of sensational scenes. Later special effects extravaganzas include The Bulleteers, in which an airborn torpedo smashes through the skyscrapers of Metropolis, and The Magnetic Telescope, in which an astronomer's harebrained invention sends an asteroid hurtling earthward. When not struggling with mad scientists, Superman takes on ferocious forces of nature like gorillas (in Terror on the Midway) or dinosaurs (The Arctic Giant). In 1942 Paramount Studios acquired Fleischer Studios and gave it the new name of "Famous Studios." They produced the last 8 of the 17 shorts and continued the series until 1943.